Between 1960 and 1996, the Guatemalan Civil War pitted the government against leftist rebel groups. Both during and after the war, there were accusations that government forces committed human rights violations against civilians. The government denied these allegations and claimed that there was no documentation to substantiate any of the claims. 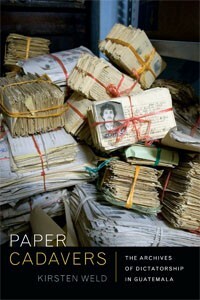 That was until a cache of documents from the National Police was found in an abandoned headquarters in 2005. That launched a massive effort to preserve and archive the documents. Despite official efforts to destroy the material and threats of physical violence, a group of volunteers worked tirelessly to ensure that it was possible to figure out what happened during the war. In this episode of the History Slam, I talk with Kirsten Weld of Harvard University about her book Paper Cadavers: The Archives of Dictatorship in Guatamala. We chat about the uncovering of the archives, the process of reclaiming the material, and the contested nature of building memory.